The Laundromat Project offers its flagship Create Change Artist-in-Residence program for artists interested in developing and mounting a socially-engaged and participatory public art project in their local laundromat and/or other community spaces. Each year, a total of 5 artist projects are supported through the program. Four artist projects are developed through a six-month residency that runs from April through October, and one project is selected for a year long residency program that runs from April to March respectively. The residency is open to artists of color who live in or are deeply invested in the communities of Bedford-Stuyvesant, Harlem, and Hunts Point / Longwood*. The program requires a significant time commitment as artists are expected to develop collaborative projects in-community amongst neighbors, local stakeholders, and community organizations. *Create Change Alumni can propose projects that take place anywhere across NYC. We are the leaders we’ve been looking for. The Laundromat Project is building our 2019 Create Change artist development program around the theme: Abundance. We are looking for artists, cultural producers, and makers of all creative disciplines, backgrounds, and experience levels to explore abundance through community-based art projects across NYC. Up to 4 Create Change Residents will be selected to participate in the 2019 program. This year’s program has been reshaped into a practice-based lab around The Laundromat Project’s pedagogical framework for community arts engagement. Our pedagogy is one that centers collaboration and partnership, where the work of the artist is created through a cooperative approach with community members and local organizations. Our aim is to develop new strategies and ideas around equitable public art, community engagement, and social intervention practices. We plan to support residents by offering individualized programs of project incubation to strengthen their ways of learning and discovery. The Residency is an experimental platform and we invite participants to explore new areas of artistic practice and methods of research. The 2019 Open Call cycle is now closed. More details on the 2020 cycle will be available in the Fall. The in-person interview date for shortlisted Artist-in-Residence applicants is Friday, March 15. Shortlisted applicants will be notified on March 8. Similar to the Fellowship program, the Create Change Residency is intended to move artists from a conventional public art model of simply placing static art objects in public spaces to one that emphasizes the ways art and artists can serve as catalysts for social action, problem-solving, and relationship building in their own communities. Residents should expect to commit to developing and presenting their laundromat and/or community-based project, alongside participating in some of the Fellowship program’s workshops and potluck dinners. The overall time commitment spans about 300 hours over a 6 month period. *If you are a Create Change Alumni these requirements are optional. 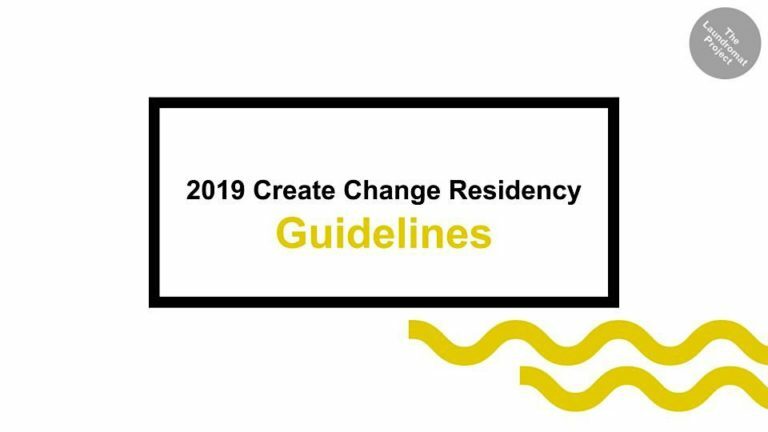 The Create Change Artist-in-Residence program provides participating residents with a stipend of $7,500 (payable in installments) and a production budget of $2,500. This year’s community arts incubator will be also include individualized coaching and guidance from LP staff and program advisors. Who should apply to be an Artist-in-Residence? Create Change Fellowship alumni are highly encouraged to apply to the Residency program. Learn more about the 2019 Open Call and program guidelines. *All Create Change Residency projects taking place in Hunts Point / Longwood should be community responsive and engage directly with community residents at the Kelly Street Collaborative Space, our creative community hub in partnership with Workforce Housing Group, Kelly Street Garden, and Banana Kelly Community Improvement Association. For the past four years, The LP has transformed a 2 bedroom-apartment on Kelly Street into a thriving creative community hub, with artist studios, arts programming, and community partnerships. The Hunts Point / Longwood artist-in-residence will have access to studio space, located at The Kelly Street Collaborative Space, to work from and possibilities to engage the larger Kelly Street community with LP staff support.